Windows has a tendency to accumulate errors and problems over time. While some of this virtual wear and tear can be delayed by rigorous system maintenance and keeping malware at the gate, the time will come when you will be forced to reinstall your system. A Windows re-installation is a tedious process. It takes time and once the new installation is in place, you essentially start from scratch. Your user files are wiped and have to be restored, programs need to be re-installed, and personal preferences have to be set up all over again. Since the ‘perfect setup’ is a work in progress, driven by all sorts of updates and new gadgets, creating an image of your operating system is a waste of time. And as time goes by, the nightmare will start all over again. Except if there was a way to re-install your operating system and fix system-based issues without losing all your stuff…. Starting with Windows XP, Microsoft has been offering what is called a “non-destructive reinstall ability” for Windows. It is a way of re-installing the operating system without changing user data, settings, and preferences, including installed programs and drivers. After re-installing Windows with this method, you will log onto your account as if nothing had happened, except that all system files were ‘updated’, which almost equals a fresh installation. If you don’t have an installation DVD for your edition of Windows 7, it’s OK to borrow one or create it with a torrent download. The important thing is that you currently run a genuine copy of Windows 7. The product key can typically be found on a sticker on your computer. If you can’t find and don’t know your original product key it is not OK to use another product key! You can, however, recover all product keys of your present installation, including the operating system itself, using Bean KeyFinder or one of the tools listed in this article: 3 Ways To Recover Serial Numbers In Windows. For the non-destructive installation to work, you must be able to boot into Windows 7 full, not Safe Mode. I also highly recommend to prepare a backup of your data before you attempt to re-install. Running SP1 can cause issues when performing a non-destructive re-installation with an installation DVD that does not contain SP1. It is thus recommended to uninstall SP1 before you proceed. Go to > Start > Control Panel > Programs and Features or > Programs > Uninstall a Program. Select > Service Pack for Microsoft Windows (KB976932) and click > Uninstall. Your current version of Windows is more recent than the version you are trying to upgrade to. Windows cannot complete upgrade. Go to > Computer, right-click on the installation DVD and select > Open. Right-click on > setup.exe and choose > Properties. Switch to the > Compatibility tab and check > Run this program in compatibility mode for: and pick > Windows Vista (Service Pack 2) from the list. Click > OK and double-click > setup.exe to launch the installation. When you run the setup.exe from the DVD, Windows will ask whether you want to allow the program to make changes to your computer. Click > Yes to proceed. In the next windows click > Install now to start the installation. Windows setup will now proceed with copying temporary files and running a compatibility check. When presented with the first selection screen (see screenshot below), select the first option to > go online and get the latest updates, then > accept the license terms and press > Next to continue. Select > Upgrade when asked which type of installation you want. You are not actually upgrading, but rather installing the same operating system over your existing installation. However, since you selected upgrade, your files, settings, and programs will be left alone. The installation takes about an hour and will re-boot your system several times during the process. Finally, you will be asked to enter your product key and after going through a few basic settings and re-starting Windows one more time, you will finally be able to log into your refreshed old account. When you first log into your account, you will also be asked to activate your account. Do this immediately to prevent restrictions. Several things were changed when your system was upgraded. You were reverted to the Service Pack version on your installation DVD (likely pre-SP1) and Internet Explorer was downgraded to version 8 (in case you were running IE9). Go to > Start > Control Panel > Windows Update or > System and Security > Windows Update and click on > Install updates. You will have to reboot and go through this process several times to bring your system up to date. If you don’t see any updates, click on > Check for updates on the left-hand side. The entire update procedure took me around 90 minutes, which was a lot faster and a lot less hassle than a complete re-installation. What are your experiences with the process? I install a lot of Firefox add-ons every week. First add-ons that I may use personally and then add-ons for review here on Ghacks or other sites. One of the things that bothered me for some time now is the artificial delay that Mozilla added to the installation process of extensions in the web browser. 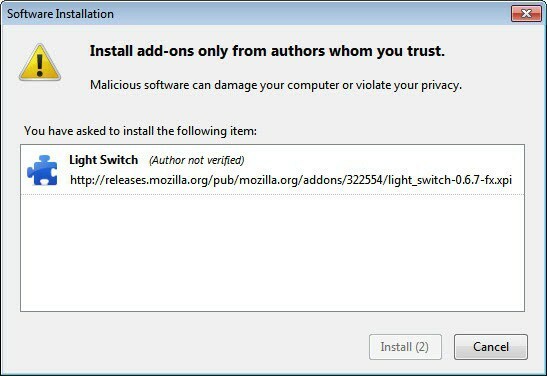 When you click on install on the Mozilla add-on repository or a third party site, you will get a notification about the download of the add-on first. Firefox displays the remaining time to download the extension. The browser then opens an installation prompt to give the user the option to go ahead with the installation or cancel it. You need to wait until the countdown ends and the Install Now button is displayed. A click outside of the Firefox window will reset that countdown, if you switch windows the installation dialog prompt vanishes completely. I do not really see a need for the delay during add-on installations. The majority of users have selected to install the add-on, and the countdown does not really add to the security of the process. The only relevant information displayed in the installation window is the add-on name and version, and that’s something that you can verify in less than a second. If you are like me you’d like to get rid of the countdown to speed up add-on installations in the Firefox browser. For that you need to enter about:config into the Firefox address bar and hit enter. First time users need to confirm that they will be careful before they can proceed. 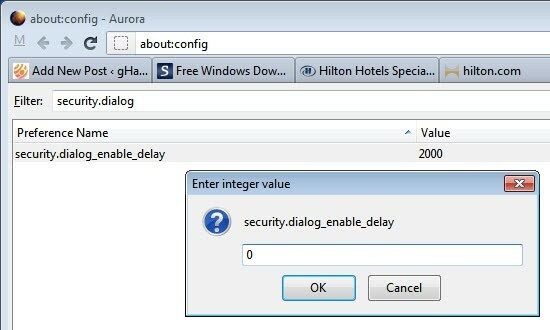 Enter the parameter security.dialog_enable_delay into the filter form at the top of the screen. Only one parameter should now be listed in the window. It has a value of 2000 which is the time in milliseconds that add-on installations get delayed. Double-click the parameter and change the value to 0 to disable the delay completely. The value should now be 0. The change is effective right at that moment. The Install Now button should be enabled immediately on all future add-on installations saving you about two seconds per installation. You can reset the setting by right-clicking the parameter in about:config and selecting reset from the context menu. If you use Skype or certain other applications on Linux, you may be annoyed by how those programs use their own notification system rather than using the system default, known as libnotify. libnotify is responsible for creating those nice little bubbles or windows that aren’t intrusive on the screen. GNOME 2.x users usually have a black bubble in the top right corner, while GNOME 3.0 users get a notification across the entire bottom of their screen and KDE users get a transparent little window in the bottom right corner, as seen in the screenshot. Thankfully though, Skype lets you change this behavior. Skype can be downloaded from their website if you use a more popular distribution, such as Ubuntu, Fedora, openSUSE, or from your package repositories if you use a less popular distribution. If you use a 64-bit system, make sure that you have the correct dependencies installed. Ubuntu users shouldn’t have a problem, but there is only a 32-bit package for Fedora which requires some extra steps in order to get it to work in a 64-bit environment. In order to change Skype’s notification behavior, you’ll need to go into the Settings. From there, you need to choose the Notifications tab on the left side. You’ll now see a fairly long list of different events that can occur in Skype, anywhere from logging in to phone calls. In order to change the correct options, you’ll need to click on the Advanced View button which is found on the right side of the window. Now, for each selected event, you can change the exact notification settings. In order to achieve rerouted notifications, you’ll first need to turn off the Display pop-up notification option so that you don’t get two notifications (one of each) at the same time. Keeping the Play sound file option enabled or not is up to your personal preference. What this command does is invoke the notify-send command, which is used by libnotify to generate a notification. “Contact Signed In” is the first parameter, which is used for the title of the notification. “%name is now online.” is the second parameter, which is used for the main text of the notification. The %name portion is a variable in which the name of the involved contact will be substituted for %name. Finally, -i skype simply tells libnotify that you’d like to use an icon (the skype icon) with your notification. libnotify can only use icons that are installed, so not any parameter will work with -i. This procedure isn’t exactly perfect, as you’ll need to copy, paste, and adjust this command for every other event in Skype. Additionally, you’ll want to avoid using this on special notification types such as calls where the Skype-default includes some buttons to accept or decline a call, whereas the libnotify way won’t present those buttons to you. libnotify is a great way to keep the notification styles of all supported applications uniform and simply “pretty”. While Skype doesn’t take advantage of this piece of software by default, it’s good to know that there are still ways where it’s possible, and who knows how many other programs support these types of modifications? What other kinds of Linux fixes would you like to see? Is there a problem you just can’t seem to solve? Let us know in the comments! The Windows 7 operating system shipped with a built-in automatic wallpaper changer that allowed users to pick multiple desktop backgrounds that the operating system would rotate automatically. Previously users had to use third party software like Wallperizer or John’s Background Switcher for that functionality. Microsoft’s upcoming operating system Windows 8 will improve that by offering to sync the primary desktop background color with the operating system’s Aero interface color. 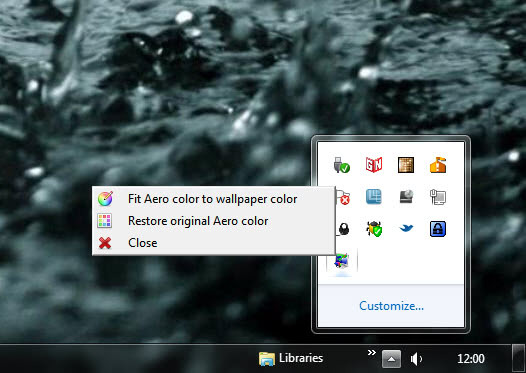 Under Windows 7, Aero and the wallpaper color can be completely different, which may be a issue for users who like to see matching colors on their desktop. Aero Adjuster now is a program for Windows that users can run to adjust the Aero color automatically whenever the background changes. All you actually need to do is to download and unpack the program on your computer system. Once done you can run it with a double-click on the single executable file. The program will modify the Aero color from that moment on to match the color of the desktop background. This is an automatic process that requires no user interaction. Please note that the Aero color is changed permanently. Aero Adjuster will not automatically switch back to the default color if you close the application. You do however have an option to restore the old Aero color from the application’s system tray menu. The core question with programs like Aero Adjuster is this: Do you want to run an additional program in the background for better matching Aero and wallpaper colors? The program does not use a lot of cpu cycles when it is running, but its memory usage can go as high as 15 Megabytes. I have reviewed a similar program called Aero Blend in the past which offers a similar functionality.